You could be ahead of the curve and are already performing sustainable practices in your store or you could just be doing the basics. Maybe you aren't doing anything because you have no idea where to start. Regardless of your situation, I am sure you have questions. So, let me provide you with some answers. Simply put sustainability is making an effort towards improving the use of resources and enhancing the potential for both current and future needs for life. As a business, this means that sustainability is more than going green, it’s also about what you provide to your customers, who you partner with, and what you do for your employees and community. If you are overwhelmed about where to start, the Pet Sustainability Coalition (PSC) has some great resources available to pet industry businesses like yours. For many businesses, the journey to sustainability has the ultimate end goal of becoming B Corp certified. Certified B Corporations are businesses that meet the highest standards of verified social and environmental performance, public transparency and legal accountability to balance profit and purpose. Don't be intimidated by the word "corporate", independent pet retailers, like yourself can also become B Corp certified. In fact, a store in Washington, DC did just that. The Big Bad Woof made sustainability an integral part of their brand and have become the first independent retailer to be B Corp certified. Sustainability is a big concept and it can be intimidating to get started, but do your research. The pet industry is full of innovative individuals who work hard to have a positive impact on people, pets and the planet. Take a look at what others in the industry are doing an follow their lead. How Do We Tackle Sustainability? At Pet Food Experts, we have always been conscious of our impact on the environment and recently we have made it a top priority. As a new member and the first distributor to join the Pet Sustainability Coalition, we are committed to reducing our carbon footprint and setting a good example for the pet industry as a whole. Just like you, we're in the business of selling pet food and like you, we were a little overwhelmed on where to start when it comes to sustainability. We had to start somewhere though, and since then our efforts have grown. Take a look at some of the ways we're tackling sustainability at Pet Food Experts. Energy efficient motion activated lighting in our distribution centers to reduce energy use by turning off lights in inactive aisles. Environmentally friendly cleaning practices are used in all facilities. Smart routing of delivery trucks to reduce travel time and overall fuel emissions. Orders are shipped in plastic reusable totes to help reduce cardboard waste. Company-wide recycling initiative on materials like cardboard, paper, plastic, and equipment batteries. Donations of food, supplies, and volunteer work to worthy causes. Employee training programs at every level of employment. Our future focus for sustainability is to expand the use of our voice activated picking solution, Lydia, to all warehouses. Lydia increases, accuracy, speed, and efficiency while completely eliminating paper from the picking process. How Can You Implement Sustainability? 1. Know where you stand. Take the PSC quick impact assessment (QIA) to help you evaluate your company's strengths and weaknesses so that PSC can help you develop custom sustainability strategies. The QIA will break down your sustainability score into four categories: governance, workers, community, and environment. 2. Educate and train your employees. Invest time in educating your employees about sustainability. This way they are more inclined to help you reach your sustainability goals. Employee training is vital to the success of your company. It is also a major component of sustainability since consistently having to hire and re-train employees can be a drain on your resources. Research shows that 40 percent of employees who receive poor training leave their positions within the first year. A happy and informed employee is the best kind to have on your team. 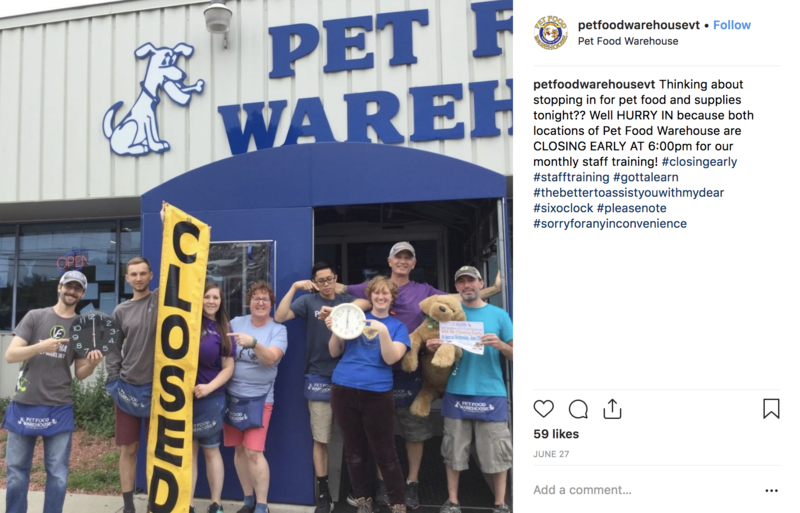 Pet Food Warehouse in Burlington, VT takes staff training very seriously and close early once a month to focus on education so they can continue to improve their customers' experience. 3. Reduce your resource and energy use. Consider installing energy efficient and motion activated lights in your backrooms, or going paperless when you have the option. Put up signs to remind your employees to recycle and what materials are recyclable. Also, make sure to take the extra time to flatten and break down boxes from deliveries for recycling. 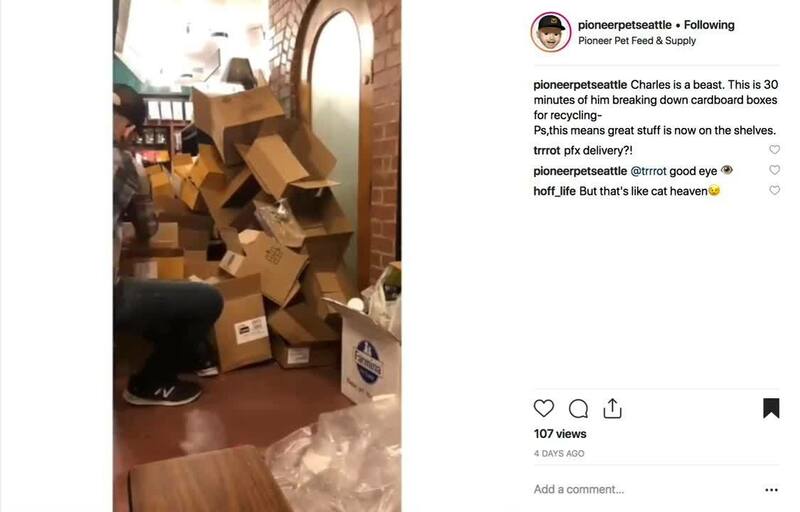 Check out this post from Pioneer Pet in Seattle, WA showing a time lapse of one of their employees breaking down all the boxes from their PFX delivery for recycling. This is a great way to share with your customers that your store is actively making the effort to be more sustainable. 4. Share your sustainability commitment and success with customers. Develop some promotions geared towards sustainability. Whether it's a sale on sustainable pet products or a coat drive that allows pet parents to receive a discount on the next coat they purchase in exchange for donating. You can take to social media and share some of the results from your sustainable initiatives and promotions. 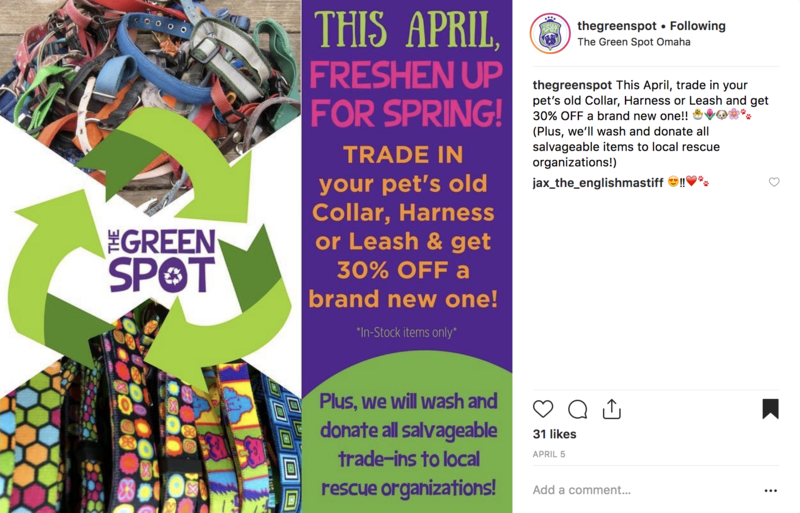 The Green Spot in Omaha, NE a pet store highly dedicated to sustainability ran a promotion to help recycle and re-purpose used collars, leashes, and harnesses by offering a discount on new ones to customers that brought in their pets' old ones. Did you know that 95 percent of pet food bags are not recyclable? It's true! TerraCycle is a company that will take non recyclable materials and re-purpose them into things like plastic tote bags or they will re-sell them to manufacturers to use on their own products. Pet food brands such as Earthborn Holistic, Wellness, and Open Farm have programs with TerraCycle so their packaging can be properly recycled. You can actually sign up to be a drop-off point for recycling pet food bags and do your part in a unique way. The TerraCycle drop-off point programs will also offer you promotional posters. You could even incentivize customers by offering a discount on their next bag if they bring back the empty one. It's not just pet food bags that are the issue, it is also the single-use plastic bags most retailers use to bag goods being purchased. Nearly, 90 percent of debris in our oceans is plastic waste. To combat the environmental impact of single-use plastic bags on the environment, some states have banned non-biodegradable single-use plastics bags or single-use plastic bags completely. To help do your part in reducing the damage done by plastic shopping bags consider switching to a paper alternative or encourage customers to bring their own bags. 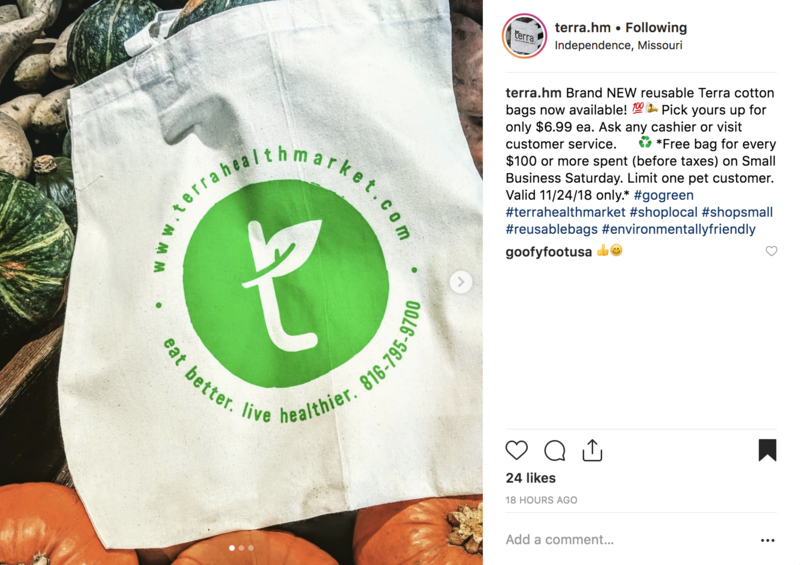 Terra Health and Wellness Market in Independence, MO created their own branded cotton tote bags to sell in their store. These have the dual purpose of being more eco-friendly and spreading brand awareness through customers using the bags in public. 5. Give back to the community. Sustainability is more than going green, it's about supporting your community so they can thrive in the present and future. Consider holding fundraisers that will benefit the people and animals of your community. This includes food drives, adoption events, and round-up fundraisers. You could also donate a portion of the sales back to a local animal rescue group. 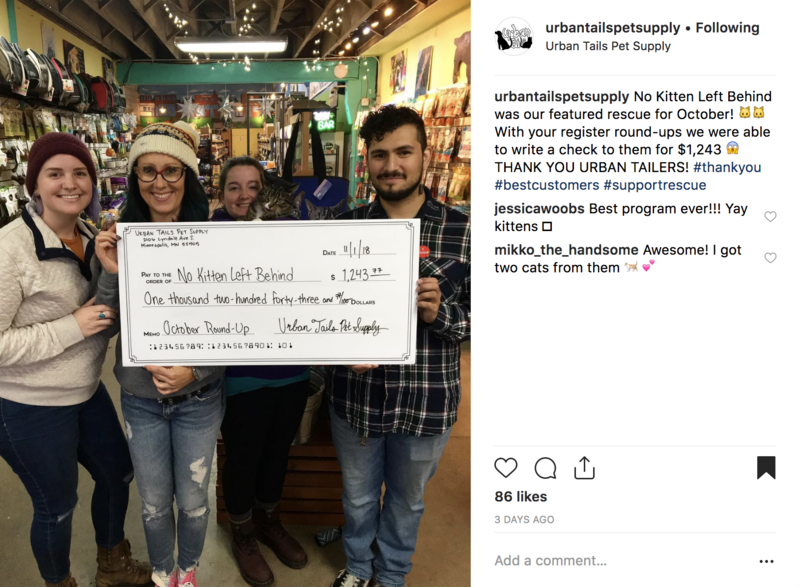 Urban Tails Pet Supply in Minneapolis, MN has a fundraiser for a different local animal welfare group every month. In October, they were able to raise $1,243! 6. Carry products from brands with sustainable initiatives. This can include: sustainable packaging, sustainable sourcing, and a commitment to charitable efforts. Do some research to help you find great sustainable products to highlight in your store. Check out the PSC's Positive Impact Program which aims to connect brands and retailers with the tools needed to promote sustainability within their organizations. Sharing products with your customers that support sustainability will build upon your own efforts. We carry many great brands with amazing sustainability initiatives. A sustainable brand new to our portfolio is Sustainably Yours Litter. 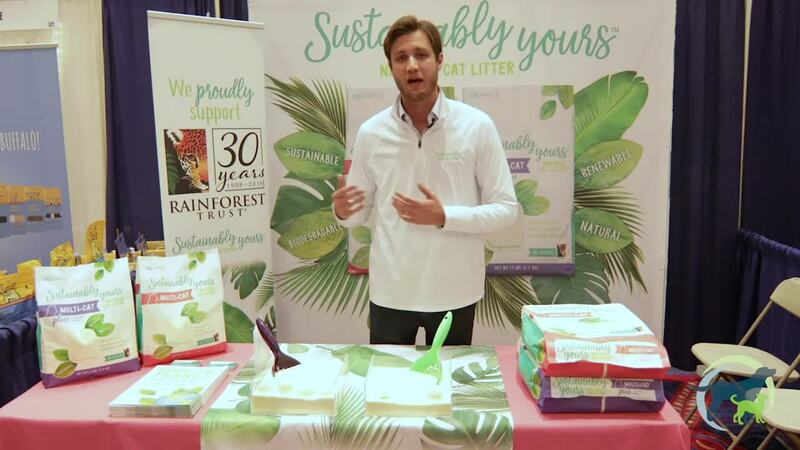 Check out the video below to learn more about how they are saving the planet one litter box at a time! Brands like Sustainably Yours has made sustainability integral to the function of their company. From sourcing and production up, all their practices support sustainability. 7. Support a sustainable supply chain. When choosing to work with a company or outsource services, do some extra research or ask questions about their own sustainable practices. Partnering with like-minded businesses will make it so you can control the extent of sustainability your business operates at. Remember that sustainability is about more than going green — focusing on economic and social sustainability is just as important. There are many opportunities for your business to become more sustainable. Whether you make the effort in a big or small way it will make a difference in helping this industry to continue to thrive. What does your store do to be more sustainable? Let us know in the comments below!